James William Masters known as “Judy” Masters or “The Little Master” was recognised as Australia’s best soccer player during his time. Born on 21 May 1892 in Balgownie, Judy was the 7th of 13 children; eight brothers and five sisters, all of whom were educated at Balgownie School. His father, Alexander George Masters was a miner from Nova Scotia, Canada and his mother, a Sydney born woman, Frances Eliza nee Campbell. Judy began school at the age of 5 and although he came from very humble beginnings, over the next seven years he became a member of the ‘Bally Boys Band,’ playing solo cornet as well as displaying precocious talent at soccer (football). He joined the Balgownie Rangers soccer team which is still in existence and according to a report Judy wrote for the club in 1946, “Balgownie Soccer Club is one of the oldest soccer clubs in N.S.W… During the 1920’s the following players constantly were playing for Australia…” Judy was at a disadvantage, he was not tall and lightly built and to overcome the “heavies” in that era he mastered the art of agility and ball control; he was very young when selected in the first team and was soon given the key position of centre forward. At the age of 13, he commenced working with his father and older brothers at Corrimal Coal Mine. In 1915 he joined the army at the age of 23 and embarked on HMAT Ceramic A40. His service included: Egypt, Gallipoli and France where he became a stretcher bearer and bandsman. 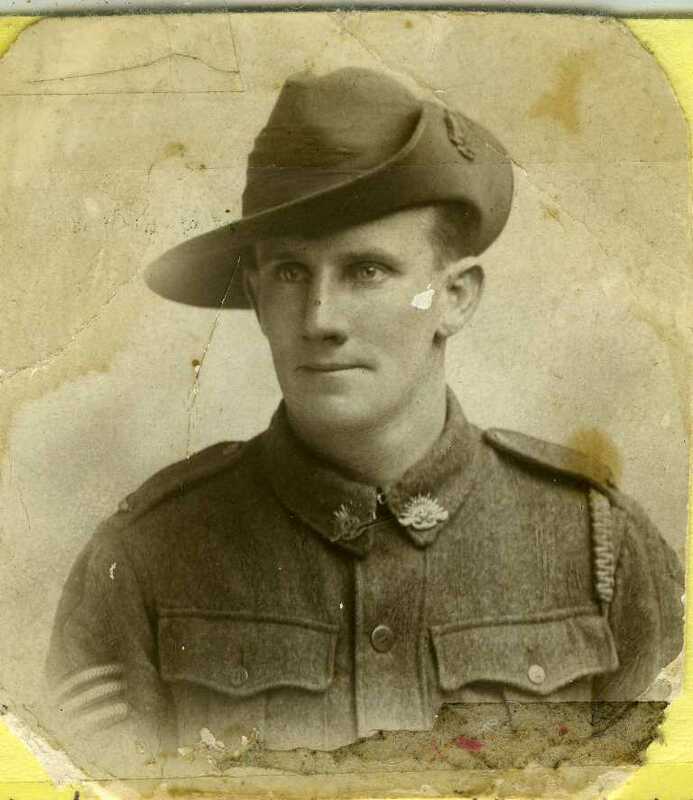 He joined the 19TH Battalion 1st AIF. He was promoted to Sergeant on 11 May 1918 and on 27 February 1919 was transferred to the 20th Battalion (late 19th Battalion). After receiving a shoulder wound at Poizeres, Judy was allowed leave in England for rehab where he met his English wife to-be, Annie Barraclough. Subsequently, his letters to Annie evolved romantically. 21 September 1917: Dearest Annie, Another card while at leisure, dinner times, having a sun bath somewhere in France. Dear, with sweet thoughts of you… Au revoir, L’amour Parfait (goodbye, perfect love). Dearest Annie, a set of cards for that album of ours. …pleasant recollections of our midnight rides to Darlington, some night that dear to me never to be forgotten. Your mention of just returning from the dance, ah dear, don’t wake it up. After returning following six years of service, he married Annie in Wollongong, 1920 and together they had two daughters and a son who passed away at 7 months. He received the 1914/15 Star, British War and Victory medals. On his return, he saved most of his earnings, buying land and building a modest cottage while the rest was kept aside to give to his youngest brother, Dave, a rare opportunity. Dave was able to gain the family’s first formal qualification as a surveyor. Judy also resumed his sports career and from 1923 to 1928, he captained Australia in 22 international soccer games against New Zealand, China (twice), Canada, English professionals and Czechoslovakia. From the age of 15, he played 401 club matches and scored 351 goals. In over 400 games, he was never cautioned. Following his retirement from soccer, he maintained an interest in all local matters. He was Bandmaster of Balgownie Brass Band for many years and always supported soccer in coaching and management positions; he continued this for the remainder of his life. He and his wife Annie visited Britain to see the coronation of Queen Elizabeth II, the Football Association Cup final and the annual world championship for brass bands at the Crystal Place, London in 1953. Judy passed away on 2 December 1955 at his home town of Balgownie at the age of 63. The Balgownie soccer ground was named in his honour: Judy Masters Park. In 1981, he was inducted into the Hall of Champions at Homebush and in 1999 he was honoured in the Australian Soccer Hall of Champions. “JUDY MASTERS 21.5.1892 TO 2.12.1955 James William (Judy) Masters was the first of Australia’s great soccer centre forwards and is a sporting legend in the Illawarra district. Born in Balgownie, he played from 1908 until 1927 with that famous club, except for short spells with Newtown and Granville and during his absence on active service with the AIR in World War 1, when he served in Gallipoli and France. Judy played 22 internationals and was captain on each occasion He represented against New Zealand (1923), China (1923 & 1027), Canada (1924), English Professionals (1925) and Czechoslovakia (1927). Against the famous English professionals he scored what is claimed to be the quickest goal ever, virtually from the kick off. Judy represented NSW at 16 years of age and played 401 club matches (then a record) scoring 351 goals. A master strategist and schemer, Judy had a powerful snap shot with either for. Whilst only slimly built, he was noted for his toughness and, although relentless, his career was without blemish. A coal miner, Judy’s achievements in sporting and civic affairs were acknowledged when the Balgownie village." N.B. Article in Sydney telegraph was written by Chris Masters, great nephew of Judy Masters; he is the writer and presenter of The Years That Made Us: Australia Between Wars, a three-part series which was shown on ABC1 last June, 2013. The DVD is available for loan from Wollongong City Libraries. Australian War Memorial, AIF – Nominal Roll, Australian War Memorial Canberra, 2014, http://static.awm.gov.au/images/collection/items/ACCNUM_LARGE/RCDIG1067562/RCDIG1067562--23-.JPG, viewed 9 April 2014. Australian War Memorial, Embarkation Rolls- James William Masters, Australian War Memorial Canberra, 2014, http://www.awm.gov.au/people/rolls/R1845725/, viewed 9 April 2014. Balgownie Rangers Football Club, History 1883-1920s,Balgownie Rangers Football Club, Balgownie, 2008, http://www.balgownierangers.com.au/?page_id=5, viewed 2 April 2014. Masters C, ‘A young nation framed by war,’ Sunday Telegraph, 26 June 2013, p.106. Mosely P, Masters, James William (1892 – 1955),Australian Dictionary of Biography, Canberra, 2014,http://adb.anu.edu.au/biography/masters-james-william-11084, viewed 2 April 2014. Sydney Olympic Park, Honour Roll- Soccer, Sydney Olympic Park, Sydney, 2014, http://www.sports-centre.com.au/nsw_hall_of_champions/honour_roll/soccer, viewed 9 April 2014.